The Dove Orchid (Peristeria elata) must be one of our most popular orchids. People actually stop me and ask for it by name. Our Dove Orchids flower every year in August and September; they are flowering now in the Central America area in the back of the Orchid Display House. The generic name, Peristeria, comes from the Greek word for dove (peristerion) and refers to the appearance of the flower. If you look inside, you can see that the column and lip are fused in the shape of a dove--the head and beak are formed by the anther cap; the neck by the arching column, and the wings and tail by the three-lobed lip. There are six to twelve Peristeria species (depending on who you you ask), so broadly speaking, they are all dove orchids. Peristeria elata is the national flower of Panama, where it is known as 'Flor del Espiritu Santo'. Because of its popularity the Dove Orchid is now a very rare species in Panama, where it used to be abundant. Unlike many other Peristeria species Peristeria elata grows terrestrially, rather than as an epiphyte, in the transitional zone between grass savanna and forest. 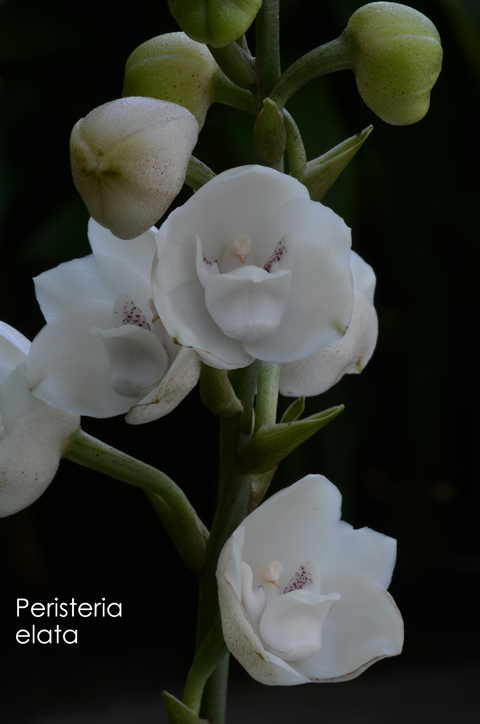 Peristeria elata is another of our Euglossine bee pollinated orchids. The waxy ivory colored flowers have a sweet and slightly resinous fragrance. The fragrance has a simple structure. It has two main components, both perceptible to people-- eucalyptol and phenylethyl acetate. Like other Euglossine bee pollinated orchids, Peristeria has an elaborate mechanism to ensure pollination. The flower's lip (the wings and tail of the dove) is hinged. Upon landing, the bee's weight tips the lip and he is thrown against the column (the head and neck of the dove). The side lobes of the lip (the wings) hold the bee, and the pollinarium is attached to his thorax as he struggles to leave.